This was one of the prettiest dishes! We had a couple straggler peppers in the garden and some yummy skirt steak in the fridge. Add in some shrimp, some onions, some mojo sauce and a squeeze of lime, and life is good. And let that sit a couple hours. Then you’re ready to cook! Squeeze a lime over the whole thing and eat up! 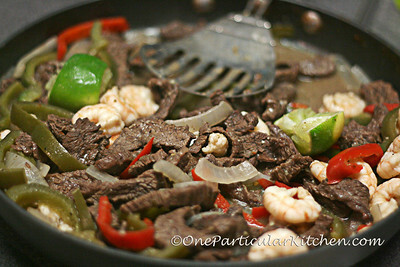 Serve with homemade tortillas, mashed black beans and fire roasted salsa or salsa roja. YUM! These look fabulous! 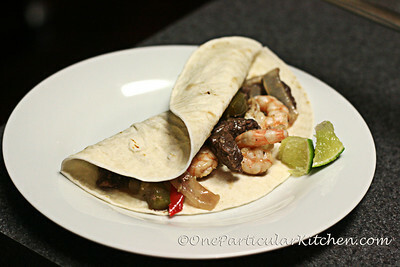 I love steak fajitas – add shrimp that’s even better.